All too often, selecting a pair of earphones means choosing between comfort or sound quality. With Bang & Olufsen's earphones you get both - automatically. Designed for durability, they can be adjusted to fit the contours and curves of the individual ear. This ensures that regardless of whether you're relaxing, walking or jogging, they always sit comfortably, and firmly, in place. Lighter-fitting headphones. Made of aluminium and hard rubber, these headphones are equipped with superior Bang & Olufsen audio performance, unique comfort and multi-functionality. The ergonomic design adjusts to the ears as easily as a pair of glasses. The designers were commended for their proactive development stance of expanding the market through design, and the company was commended for consistently pursuing aesthetically pleasing products, that users value. The Earphones come with their own specially designed leather carrying case, and a two-metre extension is also available for use with stationary equipment. Who says earphones can’t have style?
" The Bang & Olufsen Earphones are in that elite category of B&O products. With high prices, B&O is often reserved for the few that enjoy form over function. These headphones though are more affordable than some of the other products made by B&O. And the temptation was just too much for me. So is this all for show or does it actually do what its suppose to do sound good? Just the name B&O tells you that it’s all about form. Looks are the key to these earphones. Strangers stare, women look, and geeks will stop you to ask what the hell that thing is on your ear. One guy asked if it was a new mic/speaker for the mobile phone. This is the earphone to have if you want to be seen. It looks good, and it feels even better on your ears. So something this good looking and made by B&O can’t sound that good, right? Well, yes and no. Actually, the sound was much more impressive than I expected. I had a chance to test them out at the store before I purchased them. (A demo was available in June but it took me another 3 months on the "wait-list" to get the earphones.) The sound I heard at the store was extremely impressive. Cranked up the volume on their stereo, and I heard no distortion or any annoying "hiss". When I finally got them, I tried it on my home stereo, my Sony MD player, and my Sony MusicClip just to get a sense what the earphones sound like from different sources. They actually do sound very good. In many ways, they are very similar to the Sony Digital earphones that I have. They do a good job of trapping the music in your ear, so as to block out the outside noise (helps in a noise polluted place like Hong Kong) while also not letting the outside world know that you’ve got Britney Spears blaring. The only thing I would criticise was the lack of bass when I cranked up the volume. 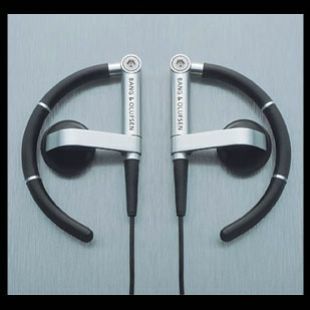 I suspect B&O designed these for the sounds of Mozart and Celine Dion, not my Paul Van Dyk CD. But, as far as instruments and vocals are concerned, these earphones are one of the best I’ve heard. However, sometimes form works against function. Much like headphones and even the Sony pseudo headphones/earphones, the B&O Earphones become uncomfortable when anyone tries to use them with glasses or sunglasses. Because the frames of the glasses/sunglasses rests on top of the earphone piece which then sits on your ear, they are a bit uncomfortable. However, with minor adjustments, moving the piece around, you can actually get it quite comfortable so that you don’t notice it. However, you’ll have to keep readjusting every time you take off and on your glasses/sunglasses. Overall though, this is a minor irritation. "These aren’t cheap. As far as earphones go, you can get a pair of Sony digital earphones for about US$40. I like the way these look though, and no one I have seen has a pair so you would definitely stand out. I definitely think that everyone should go out and buy a good set of earphones, given that the free ones you usually get with your CD/MD/MP3 player are usually the poorest sounding things. If you’ve got money to burn, and only want just one pair, these are it! " The first ear buds from Bang & Olufsen, a set for the active listener. For ear bud style headphones these do let quite a bit of external noise through which is actually quite a good thing when a stranger unexpectedly starts talking to you (these are hard to get off in a hurry!). Nearby conversations and road noise will easily work their way in and cause you to compensate resulting with a louder than normal listening session. However, this airiness gives the sound a very good light weight and transparent sound, which this listener thinks is an enjoyable experience, especially when listening outdoors. To appreciate the true merits if the A8s, they should be listened to in a quiet space where all of the sound can be heard. Fitting the A8s around our highly individual ears comfortably is something that Bang & Olufsen has guaranteed us. Through the use of three independent axes of movement, these earphones will securely clamp onto your irregular lobes with ease. This absolutely-not-going-anywhere fit has become a favourite of the mobile listener. Bass is what everyone talks about with these units and it has become a sore spot. Getting the driver to actually fit into the end of the ear canal is difficult as the driver is rather large. The lack of bass is mostly a side effect of bad fit, however, the bass is still present, audible and enjoyable for well mannered listening. The A8 really shines when playing light tracks. Mid and high range tones are the best part about these. Plucky strings and extended vocals are a real treat. New sounds will be heard too, things you've never noticed about your favourite music. Hearing these new-found details make the listening experience much more immersive. Originally designed for use with the BeoSound 2 and eventually combined with the BeoSound 6 and BeoCom Serenata, the A8 is also a great match for the ever popular iPod range. Recently a series of bright new colours were added to freshen up the now decade-old A8 and they are quite striking - a great way to match or contrast the bold colours of non-B&O personal media players. Altogether, the A8 combines the best of everything; style, design, sound and comfort. The best of the best - on the move. Q.2 Jensen's first task, as written here, in black and white.